What Is DA Form 1307? 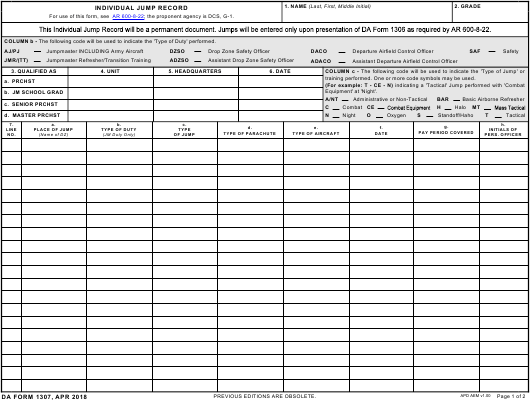 DA Form 1307, Individual Jump Record is a form used for recording parachute jumps performed by U.S. Army Soldiers. The results recorded on the form are used to determine eligibility for receiving parachutist badges and awards. The latest version of the form - often incorrectly referred to as the DD Form 1307 - was released by the Department of the Army (DA) in April 2018. An up-to-date DA Form 1307 fillable version is available for digital filing and download below or can be found through the Army Publishing Directorate website. According to the official guidelines, each entry on the DD 1307 must be accompanied by the initials of a personnel officer and the covered pay period. All entries will be copied from the Soldier's DA Form 1306 (Statement of Jump and Loading Manifest). The DA 1306 forms contain information about every jump performed by the Soldier. Each form is completed by a jumpmaster and is kept by the unit records custodian for a minimum of 2 years. How To Fill Out Da Form 1307? 600-8-22; the proponent agency is DCS, G-1. COLUMN b - The following code will be used to indicate the 'Type of Duty' performed. training performed. One or more code symbols may be used. The first two boxes of the form require the parachutist's full name and grade. The current qualification of the parachutist should be indicated in Box 3. Boxes 4 through 6 require information about their qualification. This includes selecting the correct qualification out of the given three (parachutist, jumpmaster school graduate, senior parachutist or master parachutist) and specifying the unit, headquarters and the date of receiving the qualification. The next block of the form is a chart for entering information about each jump. The chart requires specifying the place of each jump, its type, the type of plane the jump was performed from, the terms or pay period covered and the initials of the personnel officer that supervised the jump. The codes for each jump type are listed in a block on the top right of the form. Using more than one code to describe a single jump is allowed. Authorized personnel will determine special eligibility for awards based on the information provided on the form. The three degrees of badges authorized for awards are the Parachutist Badge - Basic, the Senior Parachutist Badge, and Master Parachutist Badge. Jumps performed at civilian parachuting facilities or clubs will not count towards the passing grade required to qualify for each badge.